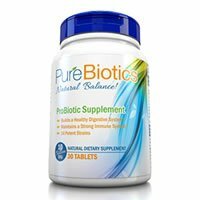 PureBiotics is a great probiotic that can work as either a daily supplement or for a specific ailment. I really like that these tablets don’t need to be refrigerated. This means they are more stable and have a better chance at surviving until they reach your digestive tract. These particular tablets are designed to have the live cells in an incubated state and aren’t activated until they’re digested. I love how allergy friendly these probiotics are. They make it safe to take for those of you with milk, wheat, soy, egg, gluten and nut allergies! As for cons, I don’t like that these supplements come in a tablet form, but that’s just a personal preference. Since they’re tablets, they have less “junk” in them and are more pure. However, sometimes it makes it hard for me to swallow pills when they aren’t coated. Thankfully, these tablets didn’t start dissolving in your mouth like other pills can, which can taste gross. Also of note, this supplement uses 14 different strains. That’s a lot and is probably overkill. These strains compete with each other, and may cancel one another out. L. casei in particular is very aggressive. But overall, this is a very good probiotic that works very well! There are 14 potent strains in this probiotic with 10 billion cells total in each tablet. Of note, the B. coagulans strain has been shown to help alleviate diarrhea such as traveler’s diarrhea, children with diarrhea or diarrhea caused by a round of antibiotics. Those with Inflammatory Bowel Disease (IBD), Crohn’s Disease or Irritable Bowel Syndrome (IBS) may experience relief from some of their symptoms while taking B. coagulans. B. coagulans may also help inhibit respiratory infections and also help the immune system get stronger. A nice addition is the usage of L. gasseri. This strain has been reported to help reduce inflammation in the body. By reducing inflammation, it may aid in the relief of menstrual pain or allergies and asthma. PureBiotics lives up to its name! This probiotic is very pure in regards to what ingredients are used, and which aren’t. These tablets are FREE of milk, egg, shellfish, peanuts, wheat, soy, and gluten. They also contain NO preservatives or artificial ingredients. I love to see a good quality probiotic that takes the extra precautions for those of us with allergies. Other ingredients in this product include: microcrystalline cellulose, croscarmellose sodium, stearic acid, magnesium stearate, silicon dioxide and shellac. Coming in at 82 cents a day, PureBiotics has a slightly higher than average price tag compared to other probiotics. You do get a solid product for your money, though! PureBiotics has more strains than your average supplement– which somewhat justifies the price. Since you are getting a wide variety of 14 potent probiotic strains, you end up getting more bang for your buck! Luckily, I didn’t notice any side effects while taking PureBiotics. I’ve heard of some people experiencing stomach discomfort while taking this probiotic but it was fine for me. If this is your first time taking probiotics, I would recommend easing into it, so your body has some time to adjust. Dynamic Nutrition offers guaranteed satisfaction with their products. They give you 30 days to return the product if you aren’t satisfied with it for any reason. I’m extremely impressed by this guarantee! This is one of the only probiotics that I’ve seen with any type of guarantee. To buy PureBiotics, click here.